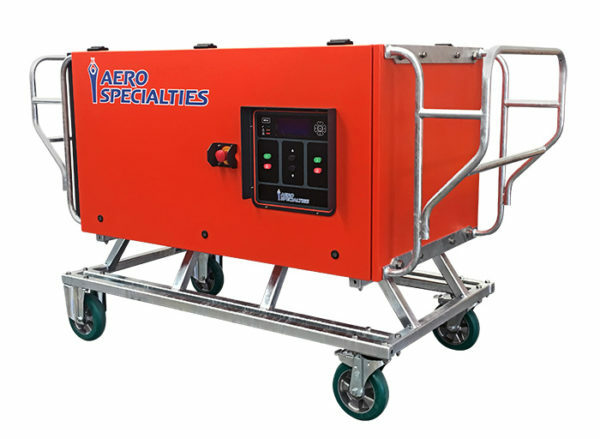 Developed in collaboration with Powervamp, the PV90 ground power unit (frequency converter) meets the specific demands of modern aircraft by delivering a genuine 90kW output from its 90kVA unit. With all power stage components in a single pull-out module – replaceable in minutes – downtime and fault finding are no longer a problem. In the pressured front line operating environment of airports the PV90-3 is a frequency converter that does not require the support of trained technicians. The PV90-3 is designed to be a zero downtime GPU requiring a minimum of planned maintenance. The PV90-3 ground power unit features an extra large high-definition integrated display with simple controls that allow interrogation of all parameters and functions such as automatic line drop compensation. The PV90-3’s features include connectivity and integration with existing communication platforms supporting a large variety of communication methods which can be used with Powervamp’s Monitoring and Billing System (MABS™). 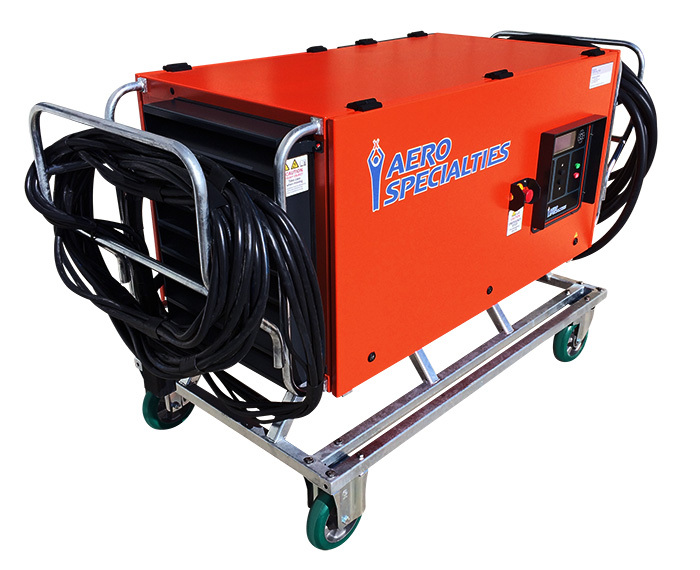 Includes 30-foot (9.14 m) output cable and 50-foot (15.24 m) input cable. Cables are pig-tailed and plug-ready (no plug included). 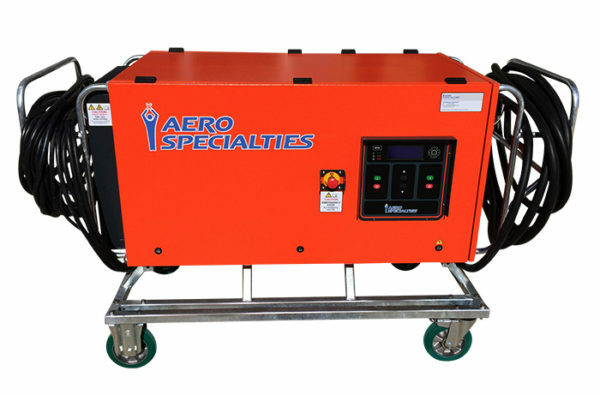 The PV-90 can also be installed as a fixed electrical ground power (FEGP) unit, providing fixed power and saving on aircraft APU usage while the aircraft is parked at the gate. As a manufacturer and exclusive provider of ground power at major air shows, Powervamp’s engineers have been uniquely placed to operate the company’s converters on all the world’s latest generation aircraft, gaining unrivaled data and experience while working alongside the airframe manufacturers’ test and field engineers. In this respect Powervamp is unique. 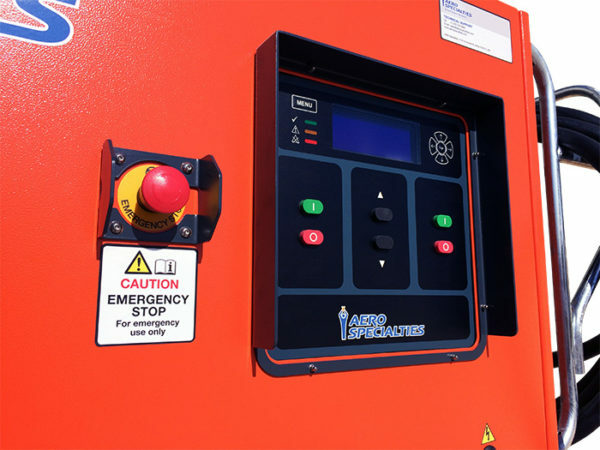 Fitted with terminal shrouds and mechanical door interlock, this ensures maximum user safety as the door cannot be opened until the switch is in the off position. Once this switch is in the on position, the system is in standby ready for use, no complicated start sequence required! The rectifier supplies low ripple DC to the inverter section using rugged 12-pulse technology, the rectifier offers near unity input power factor (> 0.97) with low harmonic content (< 8%). The inverter converts the DC supplied from the rectifier into high quality 400Hz AC using the latest PWM technology, the PV90-3 inverter is highly efficient whilst providing a clean output (< 3% THD) suitable for all aircraft. Using high grade steel ensures a compact, lightweight and efficient transformer which acts as a filter and also provides the required galvanic isolation. Complete with interlock, the output contactor ensures power is isolated from the plug until the aircraft is ready to accept power. Modern aircraft demand high overload capability, the PV90-3 offers compatibility with all modern aircraft, in particular: 777/A380/787. After ground support press the on button, the system will run for up to 5 minutes, if during this time the pilot requests ground power, power is automatically connected without any further intervention from ground support. The automatic line-drop compensation ensures each phase is individually adjusted to achieve the correct voltage at the aircraft plug. The compensation can be adjusted easily via the user interface panel (when in service mode). Remote on/off/monitoring allows the system to be controlled and monitored from a distance either from the aircraft plug or via remote switches at the end of a cable carrier system. Removable polyurethane foam filter cartridge can be replaced whilst GPU running, minimising downtime during routine maintenance. One of the most outstanding features of the PV90-3 is the pluggable Power Module. In unlikely event of system failure, the “HEART” of the system can be easily replaced by first line maintenance staff in a matter of minutes. The Power Module contains all power devices and control PCB’s which means there is a one-fix solution for almost any fault. So no matter where you are in the world, repairing the PV-90-3 is possible without the need for site attendance by factory trained engineers. Powervamp guarantees turn-around times for warranty repairs of PV90-3 Power Modules and also operate a service exchange system for when your PV90-3’s warranty expires. Powervamp recommend one spare Power Module for every 5 systems in operation. Dual seals on all doors for improved ingress protection. Stainless steel enclosure as standard. For heavy duty trailer mount option the trailer is made from galvanised steel. 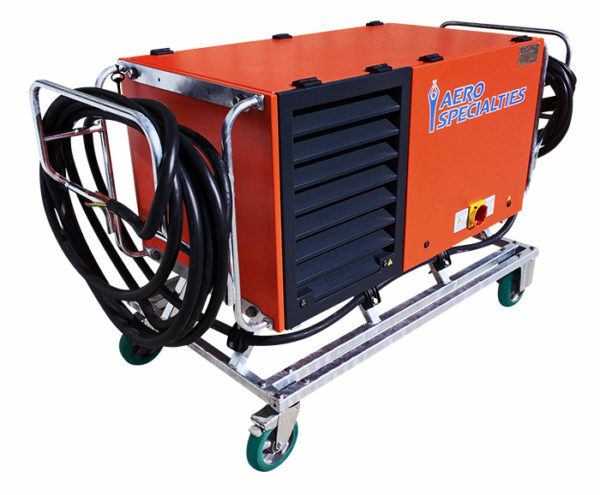 A large blue-backlit LCD screen provides detailed information of the supply and output parameters. Intelligent system status updates are also displayed providing the user with live system and interlock information. Simple menu navigation allows easy access to additional features and settings. Large rubber ON/OFF buttons offer easy robust control of the system in all weather conditions. Real time data logging of system operations as well as alarm data. Each entry is date stamped for accurate diagnosis. Output power consumption is also logged at 5 minute intervals. The PV90-3 is packed with electronic protections to ensure that the system protects the user/aircraft and system during abnormal conditions. The Powervamp MABS™ system offers real time interfacing and power usage to airport operations software allowing the monitoring and billing of ground power by time and/or kilowatt. The system can be configured by either input supply power or output load power. Utilising calibrated meters 0.2, 0.5 or 1.0 billing classes are available to suit individual airport requirements. A second 400Hz output complete with the necessary controls, interlock and hardware can be factory fitted allowing two aircraft to be connected to the same PV90-3 GPU. 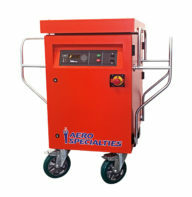 Each output is fully rated at 90kVA/90kW although the combined load should not exceed the system rating. In addition to the 400Hz output, a 600A 28V DC Transformer Rectifier Unit (TRU) can be fitted in a base module under the main system. The 28V DC TRU is fitted with line-drop compensation ensuring a stable 28V DC at the plug. 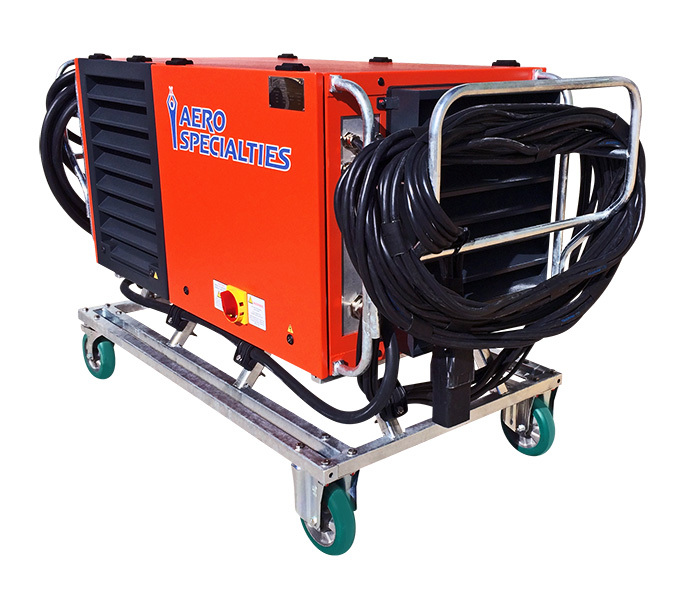 The 28V DC TRU is capable of supplying up to 2000A overload for engine starts. For improved cable entry, the PV90-3 can be supplied with a base module which raises the system by approximately 350mm. The PV90-3 can be supplied with a MODBUS interface suitable for most building management systems. It is also possible to interface with other protocols, please contact our sales team with project specific requirements.